Nobody has to tell you that productivity tools are a must when working with documents. As business professionals, your tools need to seamlessly blend in with the document tasks, workflows and procedures in place or you run the risk of creating major bottlenecks. Of course, the usual obstacles caused by documents are nothing new, especially when you work with PDF documents. They’re secure, universal and robust–qualities that win business professionals time and time again. These files are a major staple for business transactions and official records. And yet not surprisingly, they can cause a major backlog on their own. As anyone in the business industry knows, PDF documents are notorious for being difficult to work with. They lock your content down, keeping it uneditable and unusable. This is a great advantage for keeping confidential documents secured, but once you need to modify or edit the file’s content, you’ll find yourself struggling with the format. 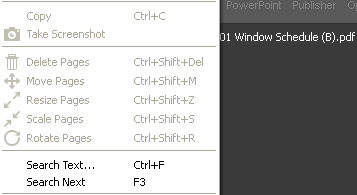 Thus, no business toolbox is complete without a PDF converter. There will always be a time when you come up against a PDF emergency. Always. For instance, you may need to edit the details on a contract or business proposal and you’re not at your own computer. Or consider the case when you upgrade your system and all your usual software is unavailable and in transition–PDF converter included. Sound familiar? So sometimes all you may need is a quick conversion for a simple PDF–nothing too big or too complex, like a simple report or itinerary you need to modify. 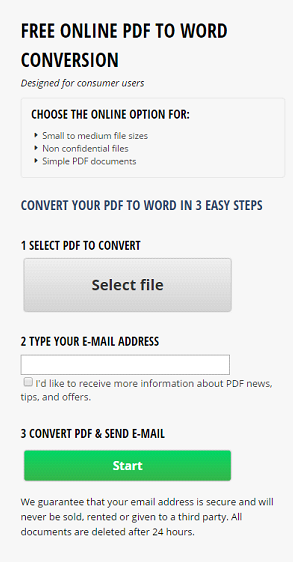 For those types of data extractions, you may want to try PDF to Word Online Converter. This web based online converter is straightforward and does exactly what its name suggests: it lets you convert PDF to Word. It comes from Investintech.com, a company that has made PDF document conversion and data extraction their speciality. And because of this, you know that you’ll get high quality conversion results you can work with. Go to the Online PDF to Word Converter. Click on the Browse button to find, select and upload your file for conversion. Enter the email address where you’d like your converted file sent. Once your file is uploaded and submitted, you’ll get an estimated wait time for your conversion and an email notification, so you aren’t left wondering if your file is being processed. When the conversion is done, you’ll get an email with a link to your converted MS Word file which you can then download to your computer and start editing instantly. If you’re concerned that you have to enter in an email, don’t be. Investintech.com will delete not only your email, but also the file you converted after 24 hours. Your information is kept safe and your document remains yours. 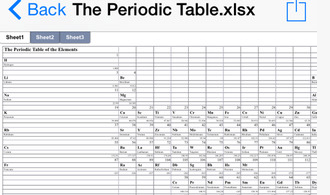 This is one web app that will fit in perfectly with your online toolbox. Test drive it for yourself. It only takes 3 simple steps and works on a mac as well!